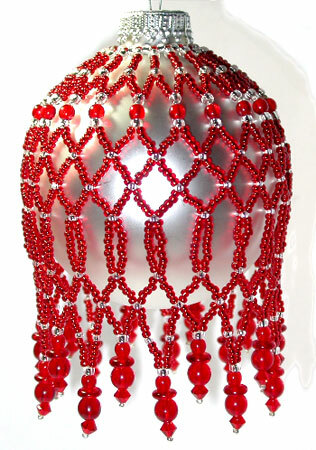 Easy netted ornament cover is just as pretty in your favorite colors. 1. String: 1 medium silver (ms), 5 red, 1 ms, 5 red, 1ms, 9 red, 1 ms, 5 red, 1 ms, 5 red, 1 large silver (ls), 1 small round (sr), 1 disk, 1 large round (lr), 1 bicone, 1 small silver (s). Skip the last silver added and pass back through beads to exit the large silver. 2. String: 5 red, 1ms, 5 red pass back up through the 4th ms strung in step #1.